Homes & Land has been a leader in real estate marketing for over 45 years, working with successful Realtors across the United States and Canada. What makes us different is that we provide our clients with a powerful omni channel marketing approach that includes print, online, mobile and targeted direct mail solutions. 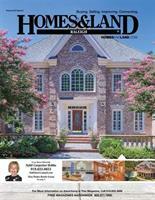 We are very excited to announce that we now have a full time “Publisher” managing the Homes & Land of Raleigh magazine. Her name is Kim Mayer. She is a longtime resident of this community and comes to us with outstanding credentials and experience. As always, we appreciate your business and look forward to continuing our partnership to help you generate leads, win listings, impress your sellers and build your personal brand. Kim is excited for the opportunity to be reaching out to you in coming weeks to introduce herself and partner with you. Kim's contact information is: 919-825-3606 & Raleigh@homesandland.com.